We Rajas Enterprises India produceing an wide range of Lab glassware and exporting the same in around 40 Countries of the world. Our range of glassware widely accepted around the world and we are having OEM from World Best Brands from German and US market. We are following DIN and ASTM standards in our Production to Produce world class lab glassware. Our Calibrated Glassware has an edge because of our precise German Auto calibratation station which is one of the Best machine around the world for calibratation. 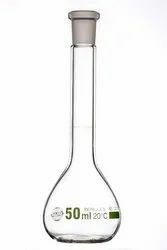 Volumatric Flask Class A made from Borosilicate 3.3 material Clear type. Capacity from 5 ml to 10,000 ml supplied with PP or Glass stopper as per Buyer choice. Calibrated with German Auto calibrated Machine. Supplied with Lot or Indivusal Certificate as per Buyer needs. 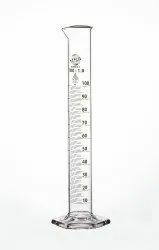 Measuring Cylinder Class A graduated Made from Borosilicate 3.3 clear and Amber glass as per customer needs. Capacity 5 ml to 2000 ml with Scale Class A. Calibratation done by German Autocalibratation machine with Certificate. Note; Indivusal Certificate Class A as per USP also available. Reagent Bottle Made From Borosilicate 3.3 glass Clear and Amber color. 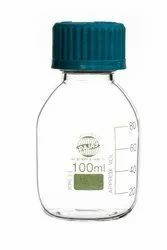 Reagent Bottle with Scale and PP cap ( color as per Buyer). Capacity 30 ml to 5000 ml.